Here's an early contender for a PR class field trip in 2010. Variety reports that Wolverine himself, Hugh Jackman, will be playing P.T. Barnum in "The Greatest Showman on Earth," a movie musical with songs written by Mika. 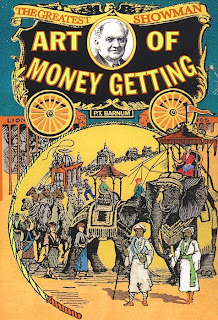 Barnum is famous for believing (if not saying) that "there's a sucker born every minute," and he's widely considered to be the father of PR, advertising, promotions, and integrated marketing communications (take that, Edward L. Bernays). "The death of Mr. Barnum removes a noteworthy and almost classical figure, typical of the age of transparent puffing through which the modern democracies are passing. His name is a proverb already, and will continue to be a proverb until mankind has ceased to find pleasure in the comedy of a harmless deceiver and the willingly deceived." Some modern-day PRs don't take the comparison to Barnum well, and instead thank him for his contributions to "press agentry," which is publicity of an extremely gimmicky nature. My favorite example: U2's giant lemon from the PopMart tour. As well, Barnum didn't necessarily back up his promotions with honesty, a hallmark of modern-day PR. However, there's a distinction to be made between lying and telling white lies. Yeah, sometimes a mermaid is just a woman in a cheap mermaid costume. But, like Mulder's poster used to say on the X-Files, "I want to believe." Another worthwhile lesson: if you try to be like Grace Kelly, and her looks are too sad: try a little Freddie! You know, it's hard to believe that a major film hasn't been made about P.T. yet. Makes you wonder when someone will attempt a biopic of the mighty J. Edgar Hoover? Or perhaps Senator Joseph McCarthy? Those could be interesting/complex character studies. Music by Mika seems like a stretch but maybe he has greater depth than his album In Cartoon Motion and its one notable song, Grace Kelly suggests. By "Freddie", I assume you are referring to Freddie Mercury, Kenton. There is a slight similarity between the two as far as vocal inflection and range, appearance, and stage persona. You bet - that's a line from the song, and Mercury is clearly his role model.